I am constantly applying hand cream (busy mum = relentless hand washing); there’s always a tube in my bag and one by my bed. At the moment I have three fabulous ones on the go so I’m ‘handing’ over my recommendations. I have always been a fan of this UK brand and they’ll be popping up in some more reviews soon. Their Wild Rose Hand Cream is a little piece of heaven for dry, beaten up mitts. It’s really rich so I tend to use it at night, rather than during the day. The smell is a heady blend of organic rosehip oil (full of antioxidants and vitamins) and essential oils of geranium, grapefruit, ylang ylang, frankincense and patchouli. Sublime. Natural credentials: Neal’s Yard Remedies use natural ingredients wherever possible and 92% of the ingredients in this hand cream are also organic. More information on the what’s in our products and technical ingredients sections of their website. This one is the handbag staple as it’s moisturising but not too rich. Organic sesame seed oil ensures the cream has a light non-greasy texture and organic sea buckthorn oil boosts the essential fatty acids content. The fresh summery scent comes from mandarin and orange essential oils. 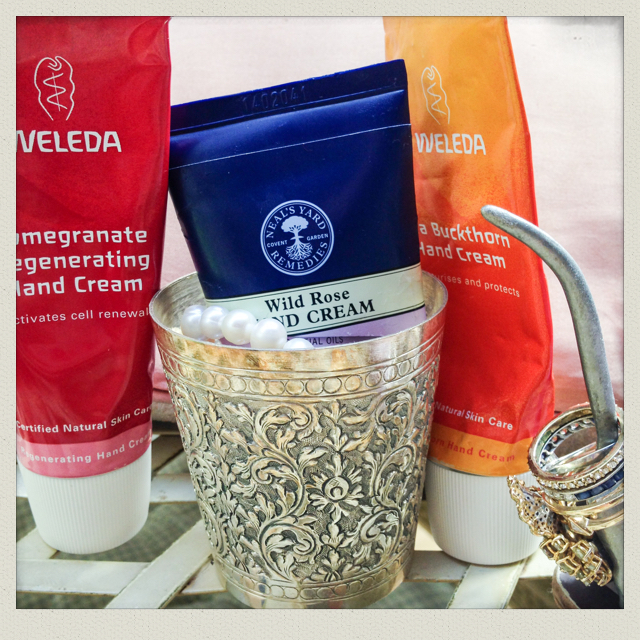 A perfect go-to hand cream for every day. Natural credentials: Certified natural skin care; organic sesame seed oil and sea buckthorn oil. Available from: Weleda’s website, £9.95 for 50ml (and some cheaper options online so worth a google). Organic pomegranate seed oil and organic shea butter give this cream a rich texture and make it a great choice for dry hands in need of its regenerative and antioxidant properties. Based on my experience of the hand cream I’m very tempted to try the rest of the range, which is aimed at the over 40s market because of pomegranate’s reputation for stimulating cell renewal. Natural credentials: All natural ingredients with organic shea butter.